Network meetings? I have heard of them, but I have never had the pleasure of attending one until this year in April, when one took place in my hometown: Groningen! To be honest, the educational side of AEGEE is a side that never really grabbed my attention. Nevertheless, I felt I had to experience it at least once. So, I decided to just give it a chance and applied for the Network Meeting in Groningen and, luckily, I got accepted. Surprisingly, I was the only participant from Groningen besides the board and the event committee. That was not really a problem though, since I like meeting new people. The Network Meeting started in a regular classroom in one of the university buildings. After everyone introduced themselves, I could not help but notice that the majority of the participants were from other Dutch locals, although there were trainers and participants from France, Spain, and Germany as well. On the first meeting, we talked about project management. In short, we discussed the concept of a project, how to define it, and the steps you would have to take to ensure a successful attempt in making one. I felt that a step-by-step approach like this really helped to keep the concept of a project fresh and clear, and eventually it seemed easier to actually have a thorough plan for a project instead of just thinking of what to do on the spot. This is something I catch myself doing unconsciously when I am writing essays. Afterwards, we had a nice break by having a tour through Groningen by none other but our favourite tour guide: Joost! Of course, as a native Groninger I knew quite a lot about the city already, but it is impressive how little I knew about some monuments and buildings at the same time. Joost surely knew how to make Groningen even more interesting than I already thought it to be ! After the tour, we were kind of relieved to get back inside the warm classroom again, since it was quite cold outside. Now, it was time for the next seminar , in which we talked about the lack of young voters during/in European elections and ways to improve their engagement in European affairs. . By brainstorming, we came up with ideas and we chose the most important and significant ideas. We further discussed how to put this into practice effectively. Since we took this task step by step again, it felt much clearer and easier to actually come up with a decent project and plan. I felt I was actually learning something and believe me, I do not often have that thought. This seminar concluded the educational part of the day. Afterwards, we had delicious pancakes for dinner. Now that our stomachs were filled, I headed to my place with some other participants to have some pre-drinks before we went to the party at the Golden Fust. We did not stay too late, because we had to wake up early to catch our bus to Ameland the day after . The next day we traveled to the island of Ameland and started our stay by a walk on the island, after that the biggest activity of this Network Meeting could begin. 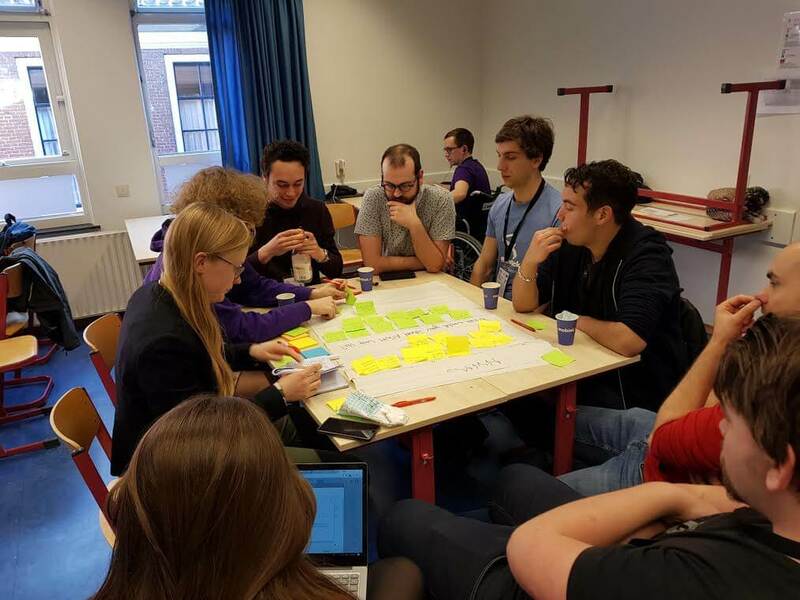 We were divided in three groups and every group had to come up with an idea for a new AEGEE event or project. My group came up with a hitchhiking relay race. This entailed that at least three antennae from different nearby countries should collaborate. For example, the first few couples from AEGEE-Groningen will travel to Munich. After a few days of enjoying the city with AEGEE-Munich a new set of hitchhiking couples from Munich would further travel to Budapest, and so on. Our reasons for developing this plan were that it would enable to strengthen ties within antennas and promote hitchhiking as a green means of transport since, you know, less cars on the road means less air pollution. The next day we would go deeper in the project, since we had to present all of it at the end of the weekend. Between working on the project, we had a short lecture on the new online privacy law of the EU. When the sun was setting and we had a great meal in our stomach, we were ready to head to the beach to sit next to a nice campfire with some beers. Because the European Night was the evening after, most of the reasonable people went to bed relatively early. I was not one of them. The next day, we finalised our hitchhiking relay race idea and presented it to the rest of the group. The two ideas the other groups came up with were an AEGEE festival and the making of an AEGEE wikipedia site. Sadly, we did not win. However, I felt it was a great idea nonetheless and discussing it further with my group felt like we were actually a team. No one got excluded and we all provided our two cents for the project. The last session I attended was about dynamics in work environments. We were introduced briefly to the sixteen Myers-Briggs personality types and from there on we discussed about communicating in an effective and professional way in the workplace. We did this by discussing example sentences where, hypothetically, one person would criticize another person and the contents of the criticism varied from passive-aggressive to downright rude. Per sentence, we attempted to conclude whether the criticism was voiced in a constructive and professional way. This one stuck to me the most out of all sessions, since I love analysing communicational skills and the dynamics of this communication within several groups, whether it’d be at work, at school or with friends. When the evening slowly set in , it was time for the, you guessed it, European Night! As always, the food was delicious and the drinks, as far as I remember, were very good. Rumour has it I dozed off on the couch when I started to get a little too intoxicated. The day after, we all went home where everyone went their separate ways to their homes. So, what did I think of this Network Meeting? Honestly, education has never been my favourite part of AEGEE, but I liked it a lot! The trainers really did a great job on including everyone in the sessions and they did it in such a way that I kept paying attention. I felt they had a good idea of how to keep the participants interested by presenting the content in a clear and simple manner. Because it was so easy to understand the sessions were not difficult to keep up with and think along with your group. Most educational AEGEE sessions I had previously had were not as inclusive and active as this one. With every session you felt inclined to participate and not in a forced way. I hope the things I learned will be usefull later. Would I participate in one of these Network Meetings again? If I have the time and money for it, I will definitely consider it and so will you, hopefully, after reading this!